To learn how to accurately code in ICD-10, you must practice coding. 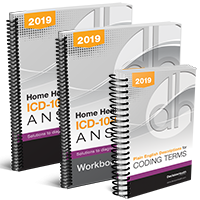 DecisionHealth's Home Health ICD-10-CM Coding Answers, 2019, is the perfect resource to help you practice coding the most common and most complicated home health scenarios so you can then apply your knowledge to real-life coding cases. BONUS: You’ll get a pocket guide of plain-English descriptions for ICD-10 coding terms common to home health that may be encountered while coding or reading medical documentation. It covers the definitions, abbreviations and proper uses of symptoms, diagnoses, conditions, anatomical areas, procedures, surgical techniques, medical equipment, drugs and more. 100% Money-Back Guarantee: If you don't agree that Home Health ICD-10-CM Coding Answers, 2019, helps train you and your coding staff in ICD-10, return your purchase within 30 days from receipt for a full refund; no questions asked.